Apple CEO Tim Cook took an open and very public stance on gay, lesbian, and transgender rights over the weekend in a Wall Street Journal op-ed piece. Setting aside the fact that it's unusual for Apple as a company to take a stance on political issues, its leadership rarely talks openly and Mr. Cook's candid comments are a welcome change in a world where far too many people are quick to discriminate against people with different political, religious, or sexual views. Mr. Cook's op-ed piece was a call to action for Congress to support Employment Nondiscrimination Act, a bill that's designed to protect the workplace rights for anyone that doesn't fit in the stereotypical heterosexual framework. If passed, gay, lesbian, and transgender workers will gain the same anti-discrimination protection the Federal Government extends to employees based on gender, race, disability, and religion. The idea is that all people are created equal and should be treated as such. The unfortunate reality is that people suffer from discrimination and personal or even physical attacks every day simply because of who they are, so we need guidelines in place to help prevent that from happening. In this case, that includes workplace anti-discrimination legislation. In other words, not only is protecting civil rights good for people, it's good for business, too. Mr. Cook backed up his words with action. Apple has a long standing policy that goes well beyond Federal anti-discrimination laws, and is setting an example for other companies to follow. What Mr. Cook, and by extension Apple, is saying is that he doesn't care who you are; just be the best person for the job. That's a strong message, and empowering for employees. For Apple, it means there's a higher likelihood of getting productive and creative work from its staff. In some cases, the hours they spend at Apple every day may be the only time employees aren't facing hateful treatment for simply being who they are. In this case, Apple represents a model of what we could have instead of what we will need to ensure workers are treated fairly. Apple already has policies in place that promote the idea that everyone deserves to be treated fairly regardless of who they are, but many other companies -- either as a policy or through their corporate culture -- choose a discrimination philosophy, so we're forced to enact laws for protection. In a country where we already have more laws than anyone can keep track of, we're facing enacting more simply because some people aren't capable of treating people fairly. The better solution would be for people to treat each other as equally regardless of their differences, just as Apple does. The reality is that far too many people are happy treating those that are different with disrespect. In theory, we shouldn't need any anti-discrimination laws because companies that treat their employees fairly should be able to draw in better workers while companies that discriminate lose talent to jobs in better environments. Over time, businesses see that discrimination hurts them and they change their policies to better compete. History has shown that, at least in the United States, without Government protection in place, businesses that choose to discriminate rarely find incentive to stop. 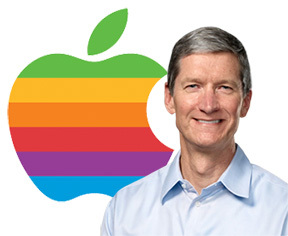 Mr. Cook said Apple works hard to make "a safe and welcoming workplace for all employees, regardless of their race, gender, nationality or sexual orientation." Apple isn't alone in its stance because there are many other companies with similar policies. For the others that choose to discriminate based on sexual beliefs and lifestyles, there's a chance that the Government will step in with more regulations. "Protections that promote equality and diversity should not be conditional on someone's sexual orientation," Mr. Cook said. "For too long, too many people have had to hide that part of their identity in the workplace." Sexuality is, however, a hot button in U.S. politics and has a way of dividing law makers down party lines. Currently the bill before Congress is seeing strong support from Democrats and strong resistance from Republicans. Should the bill die, the message Congress will send -- intentional or not -- is that sexual discrimination is acceptable.